Cozy house completely installed (type chale) in the middle of 1200sqm of tropical garden. 25m² suite with air conditioning, ceiling fan, 1 double bed and 3 single beds, musketeers in beds and windows. Possibility of bed with protection for small children and baby crib. Fully equipped kitchen. Electroporables (microwaves, liquidif. Etc), refrigerator with freezer. Large bathroom with shower, hair dryer, toilet paper, baby bath. Internal and external spaces for meals, terrace with living and hammock, gazebos and sun loungers in the garden. Parking inside the property with portao eletronico. Wi-Fi by free optical fiber. 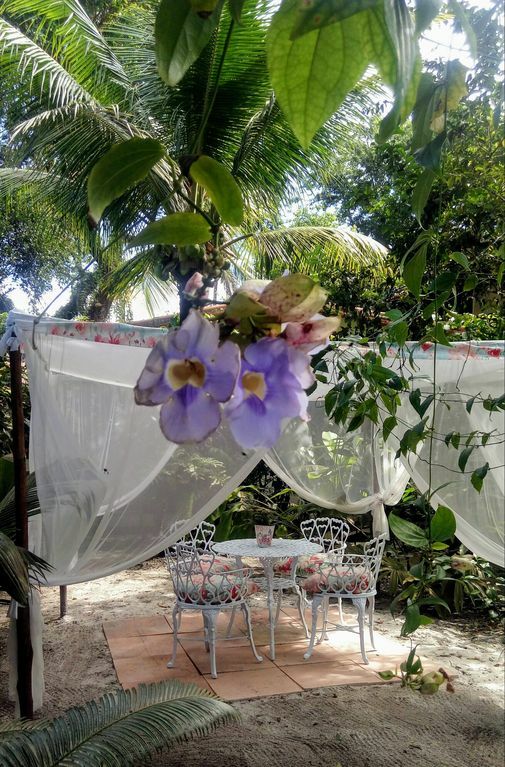 Our guests have access to the beach across the street and through the Arraial Bangaló hotel which, alias, offers free use of swimming pools and play areas with children's playground. We do transfer in / out airport and private tours to other beaches and tourist centers. We have 2 independent quadruple rooms that can be attached to the rental of the chalet at an additional cost. Rent of 2 bikes available. We are holistic therapists and Thetahealers, we have a care office that works at the same time. The name of our house is 'Beyond the Horizon' because the song of Roberto Carlos is a perfect description of her and Arraial d'Ajuda. We are between the beach and the mangrove, among the quiet and the revelry. Here you guys find joy and happiness for sure !! You can walk to the center of Porto Seguro with the famous 'Catwalk of alcohol', cinemas and restaurants. Pro north, a15min. have the beaches and tents 'North Rim', Red Crown and Cabralia with the artisan market of the Indians Pataxós. The History Center and the Discovery Park are also nearby. Café da manha e refeicoes opcionais a pedido com custo adional . Traslados in/out aeroporto e passeios privados.